We discovered Harkola Foods a couple of years ago, when we first started buying flour in bulk, and have been regular customers ever since. This wonderful food wholesaler is based in the western Sydney suburb of Auburn and we’ll visit several times a year to stock up on supplies. They offer an enormous range of nuts, flours, dried fruits, spices and Middle Eastern specialities. You can also buy packaging materials, baking supplies, rice and oils there, all at amazing prices. Parchment paper – as the standard width is too narrow for our 90cm oven, we purchased a 120m roll of 40cm wide paper for $30. The narrower size is also available, as are foil and clingfilm in huge rolls. 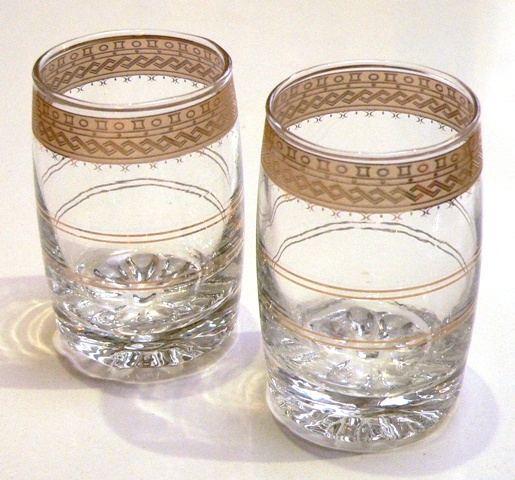 The gorgeous mint tea glasses above were a tiny 82c each! We picked up two bags of Manildra bakers flour for friends. These were $11.50 per 12kg sack and, because Harkola sell a pallet load of this flour every week, the stock is always fresh. Dried yeast, which I stock up on about once a year, is available vacuumed packed at $3.50 per 500g. They have a huge range of nuts available – we bought almond meal at $12/kg and whole roasted macadamias for $20/kg. There was also a wide variety of dried and glace fruits on display. 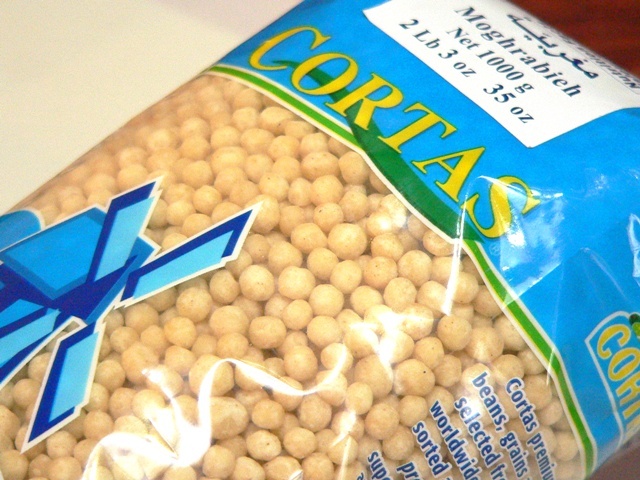 Legumes galore – red lentils and white beans were $2.80/kg and popcorn was just $1.80/kg. Spices are plentiful, and I bought some ground cumin ($10.25/kg) and ground coriander ($7/kg). Again, the rapid turnover of these items ensures their freshness. In addition to the staples, we picked up some more unusual food items. 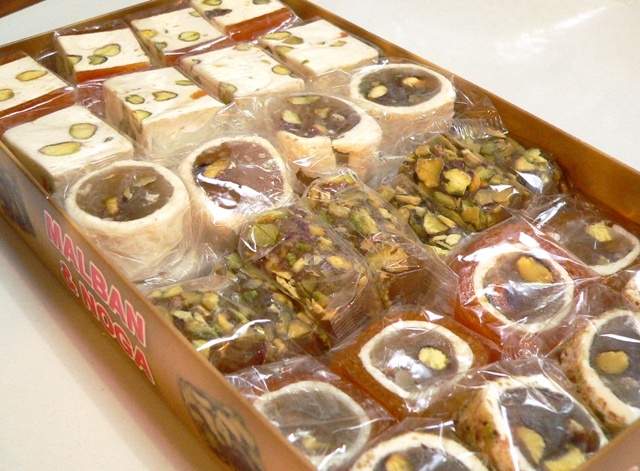 These Lebanese sweets are made from pistaccio nuts, apricot paste, nougat and date paste. This entire box of individually wrapped treats was on sale at $6.50. There is, of course, lots of couscous on offer, including the medium sized Israeli couscous as well as this larger variety from Lebanon, known as Moghrabieh. These small balls of semolina swell up to the size of miniature peas when cooked! 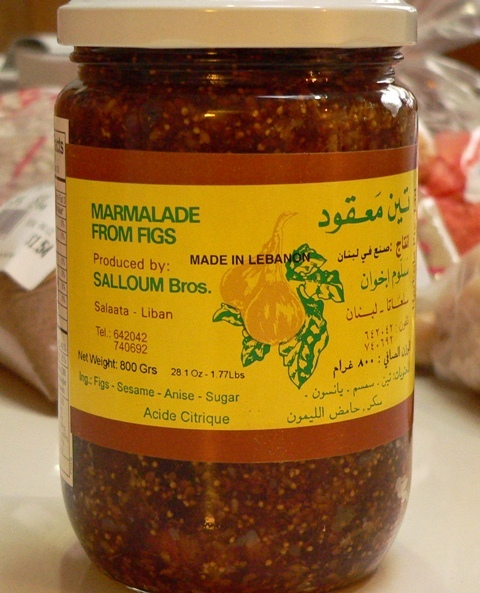 A new find for me – fig marmalade from Lebanon. This has a deliciously interesting flavour, as the jam includes both sesame and anise, as well as the usual sugar and acid. Imagine sweet figs with a hint of tahini. I suspect this was the secret ingredient in an Egyptian chicken and harissa dish we tried recently. Given how expensive fresh figs are here, it’s hard to believe this 800g jar stuffed with delicious fig paste was just $4.99! Wow that place sounds amazing. An Aladdins cave for foodies. Any interesting cocoa/chocolate purchased?? Surprisingly, no. There really wasn’t much chocolate there at all – the closest was some ground carob (which I know isn’t close at all). There might have been some chocolate covered nuts in the display cabinet, but I didn’t really pay too much attention. I love shops like that. I found one in Melbourne one time when I was up there on business. End up buying tons of stuff and having to stuff it into my laptop bag so I could bring it back with me. They sold in bulk these rice cracker things that my kids and I love, and that we usually buy in tiny packets at ridiculous prices from Japanese shops – so a big bag of them went into the bag. I wonder if your shop in Auburn has them too. Ofcourse I can’t go to Auburn because I will then also go to this fantastic lebanese sweet shop (yes, I drove all the way out there just for that one morning when I was supposed to be working). Eating lebanese sweets by the kilo is not recommended….it catches up with you….also by the kilo! I thought of you when I was at the store, as I suspect those Lebanese sweets we bought would have been gluten and possibly also dairy free. I saw the rice crackers, but have to avoid them as I can’t stop eating them. I’ve sworn off baklava as well – too delicious, too expensive calorie-wise! Fig – a – licious !! Wow, Moo, that Gaganis site looks amazing! I’m there! I think I need some mint tea glasses – so suggestible! 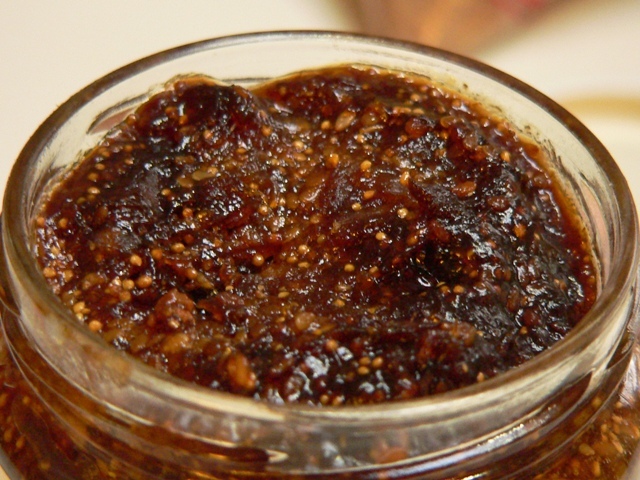 The fig marmalade is magnificent. Found the couscous at a prominent local butcher for $11 a packet. I bet Harkola was cheaper! I read the packet – its imported by Harkola. Do you think the parchment paper can be used for b’stilla? Really? The 500g pack of Moghrabieh was under $5 at Harkola! I’ll get you some next time we’re there, as well as some more fig marmalade. We use parchment paper for anything you’d use Glad Bake for – does that help? I’ve never made bastilla – isn’t that the phyllo and pigeon dish? I’ve tried that brand of fig marmalade and its delcious, even though a bit thick in texture. I looked longingly at a black fig tree in the nursery at lunch time….$75! Perhaps they have fig trees in Auburn at a better price. So I wonder what the equivalent shop in Melbourne would be? Any suggestions welcome.